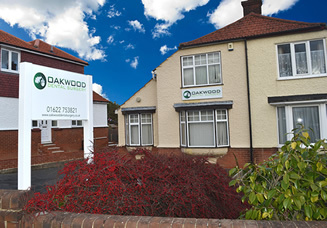 Oakwood Dental Surgery is an independent practice based just outside Maidstone town centre. The practice has been here on the London Road for many years, and has always had the same ethos. To spend time listening to our patients, to discuss different treatment options, and to provide good quality care for all. As a patient, your welfare is of paramount importance to us, and all care will be taken to ensure your visit is a pleasant or even pleasurable experience. We are on the London Road, in Allington, just outside Maidstone. By car: The surgery is located on the A20 in Allington, a short drive from junction 5 of the M20 towards Maidstone, just past the Tesco Express and the speed camera on the left, our free car park is also on the left hand side. From Maidstone, follow signs towards Allington and the M20, a short way past The Sommerfield Hospital and The Pippin public house, we are on the right hand side. We have a free car park and there is also free parking on the surrounding streets. On foot: The surgery is a 20min walk from Maidstone town centre or Maidstone East and Maidstone West railway stations.